Amy Gerstler & Alexis Smith recently spoke about the art of collaboration at the Honor Fraser Gallery in Culver City. This installation is part of a larger exhibition, one that focuses on Portraiture. They re-mounted part of their show “Past Lives” which is a psychically charged stage set that creates the effect of a mythical classroom. 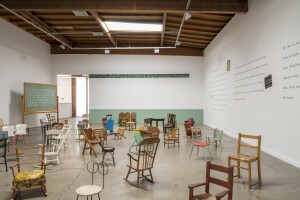 There are more than a dozen children’s chairs, all of them beaten up by generations of children. The text on the wall summons up the commingling of past and future—there are horoscopes and hints to the Fates of all of these children. A blackboard tilts in one corner of the room, full of cryptic writing in strong slanted penmanship. David Ulin’s “Writers and Their Influences” class and Brighde mullins’ “Ekphrasis” classes turn out to hear poet AMY GERSTLER and visual artist ALEXIS SMITH talk about their collaboration at the Honor Fraser Gallery. Of their collaboration, Alexis Smith said that she and Amy summon up or create a third person – and this person is the real artist behind the work. “We make-up a third person, who is not a collage artist or a poet,” Alexis said. That idea of a persona who is a sculptor, and who comes into being because these two are collaborating, is such a fanciful idea. It’s also a perfect way to think about the combined forces that these two artists generate in making this Magic Schoolroom. ALEXIS SMITH’s work has the kind of wit that undermines the status quo. Her collages always seem to use language, and to summon up great writers. Indeed “When I met Alex she was only working with dead writers—Whitman, Raymond Chandler, Borges, Longfellow, Kerouac,” Amy said. Amy said that she wanted to hang out with Alexis, but the only way that could happen was if she worked with her on a project. A thousand startling juxtapositions animate her pieces. It’s an eccentric (a word that Alexis Smith used) body of work, an insistent one from what I’ve seen, and it makes demands on a viewer. You have to put a kind of mental pressure on the images and language for them to release their often funny, always critically sharp, punchlines. The pay off is often that feeling of consolation that someone else sees the inherent absurdity in certain manifestations of culture and capitol and the types of manipulations that we are all prone too, since we are so often in a prone position as consumers. The audience included the MPW class on Ekphrasis that I taught….and once again the word Ekphrasis came up for discussion. It is a pretentious-sounding word, but it is an accurate one, one that means “description” in Greek. And, after all, as Wallace Stevens noted “accuracy of observation is the equivalent of thinking.” Amy noted that Alexis’ process is a sort of “reverse ekphrasis.” This brilliant observation drew no response from the audience but bafflement, but I know what Amy meant. Has no morals. Suffers from migraines. Refuses to bathe.